Chaz Davies is hoping he can put himself in the shop window for a full-time MotoGP ride in 2009 after he clinched a deal to join Alex Barros in the D’Antin Ducati team for the final three rounds in Phillip Island, Sepang and Valencia. Davies got final confirmation on Friday from Spanish team boss Luis D’Antin that he will be riding in the Phillip Island (October 14) and Sepang (October 21) races, with a deal also including the season’s final round in Valencia in early November too. Chaz Davies had agreed a deal to replace sacked Alex Hofmann in last month’s Japanese MotoGP in the Twin Ring Motegi, but he was forced to withdraw through injury. A puncture wound in his left elbow he suffered in a two-day Mugello test session earlier this month got infected. Chaz Davies, who flew to Australia on Saturday night to spend time with close pal and new world champion Casey Stoner, told MCN: “I was really disappointed not to go to Japan but there was no way I could have done it with my elbow. Chaz Davies is hoping to put himself in the frame for a permanent premier class ride in 2009 with a Bridgestone tyre testing deal for next year now looking uncertain. Controversial plans for MotoGP to switch to a one-make tyre rule next season could force Ducati to scrap its tyre testing squad, but Davies said: “They are waiting on the final decision about that but it could mean they ditch the test team. 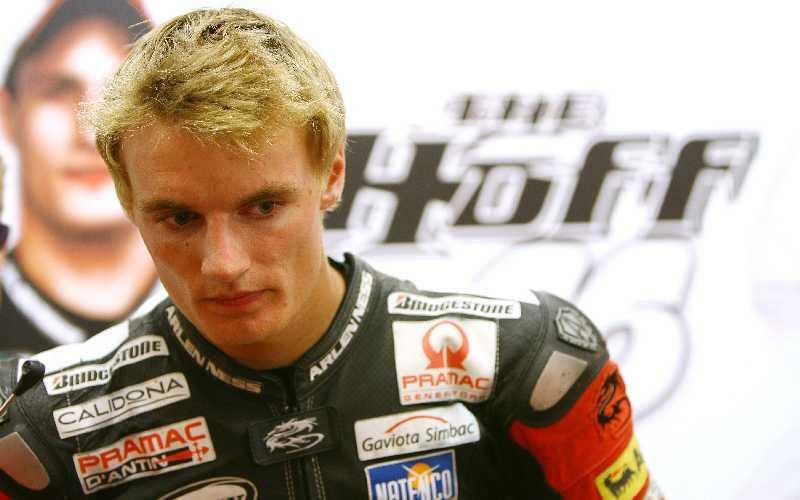 Davies quit world championship racing after a nightmare 2006 to resurrect his career in the American Supersport and Formula Xtreme series. And he added: “I was expecting a long road back. I’m not saying I am back but just to be given a chance to have a go on and test a MotoGP bike is a great opportunity. “It is more of a test for myself to see what I am made of, just see exactly where I’m at. It was a sideways step in my career going to America but I wasn’t going anywhere in 250 GPs. Chaz Davies thrust himself into contention for the D’Antin ride when he claimed an impressive 14th place finish when he stepped in as an 11th hour replacement for injured German Alex Hofmann in Laguna back in late July.